How’s this for squeaking in under the wire? When I learned about the NYRB Reading Week hosted by The Literary Stew and Coffeespoons, I had just received a review copy of one of the newest NYRB books through the LibraryThing Early Reviewer program. 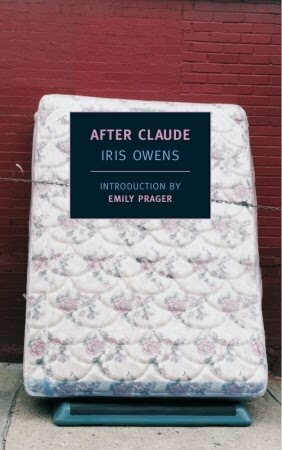 The book, After Claude by Iris Owens, was first published in 1973. In it, the main character and first-person narrator, Harriet, recounts the final days of her relationship with the titular Claude and the aftermath of their breakup. Claude, who had learned his English in England, spoke with one of those snotty, superior accents, stuffed into a slimy French accent, the whole mess flavored with an occasional American hipsterism, making him sound like an extremely rich, self-employed spy. I forgive myself for not instantly despising him, because one: it’s not my style to pass hasty judgments on people, and two: it was my luck to meet him under circumstances that made anyone not holding a knife to my throat look appealing. Before long, though, I realized that this bit of snarkiness is really just a piece of Harriet’s extreme self-centeredness and meanness in which everyone who tries to be a friend to her is pushed to a breaking point. She is a nasty piece of work, mooching off friends and lovers and ignoring anything they say that might possibly indicate that she is anything other than an ideal person. Her sense of entitlement knows no bounds. There are a few moments when you get the sense that Harriet wasn’t always this way. Harriet has recently returned from Paris, where she spent five years—leaving only after the American consulate put her on a plane to New York and took her passport. Her friend Maxine worries that something happened in Paris to turn her into the angry woman she is now. There is something about her actions that seem out of control, and the knowledge that she wasn’t always so nasty made me wish she would get help. But this is no inspirational book in which the nasty person grows a heart. And, really, I don’t think I would have liked it much if it had been. Harriet without the snark would just be boring. If she could lose the nasty and keep the wit, we’d be in business. That’s not, however, the story Owens is telling. She chooses a different route. The final chapters, set in the Chelsea Hotel and involving a group that I suspect was inspired by Andy Warhol’s Factory, are somewhat stranger than the rest of the book. We still have Harriet’s oddball inner monologue, but the stuff going on around her is even more bizarre. I didn’t like this part as much as I did the earlier chapters, but it did leave me with a different impression of Harriet’s situation. As annoying as Harriet’s self-absorbed nature is, it carries with it an extreme neediness. She wants freedom, but she isn’t willing, or perhaps able, to do the hard work that allows a person to be free and independent. By choosing to depend on the kindness of others, Harriet has left herself vulnerable, without any inner resources. Extreme self-confidence (or self-delusion) will only get you so far. What happens when there’s no one left to rely on? That’s the question I was left with when the book ended. OMG, that passage had me snorting in laughter. Based on the rest of your post, I don’t think this is quite my style, but heeheehee. When Harriet is funny, she is hilarious. I alternated between hysterical laughter and gasps of shock. I like it when other characters in books hint at things about the point-of-view character that the point-of-view character doesn’t necessarily know, or won’t necessarily admit, about him- or herself. I love that kind of thing too. The fascinating thing about this book, though, is that the other characters have gone way past hinting. They tell her, to her face, that she’s being a jerk, and she just denies it. And then proceeds to act even more outrageously. I really liked the passage you quoted, but like Eva I am not sure if this would be a book for me.. I chose one of the funniest bits, I think. But there are some situational moments that are pretty funny too. Still, you’d have to be prepared to deal with a terrible person as your narrator! It seems that the two books I’ve read for the reading week, and the books that interest me the most are the ones that toggle between hilarity and shock. So this book seems right up my alley. Thank you for this review and for joining the NYRB Reading Week! Thanks for hosting. I enjoyed reading the reviews this week. I saw a bunch of reviews for Wish Her Safe at Home, which does sound similar to this (but maybe less mean). Great passage and just the type of reason I added the book to my wish list this week. Like Nicole, I am capable, even interested in, watching train wrecks. How far will this go? You want to know but you don’t want to know, right? But as for that cover… not sure. Does it have some special significance to the work? A do enjoy a literary train wreck now and then. And your guess is as good as mine on the cover. It even looks like the mattress is sitting on a stepper from a step aerobics class, which makes no sense. I love the sound of this – I think there is a skill in writing odious narrators. NYRB Classics have really surprised me by the breadth and fascinating subjects of their list – I can’t wait to read more! I agree. 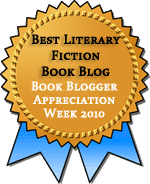 Odious narrators can make great reading when done well. The Chelsea Hotel section brought me a different perspective as well, and I think was where I reached your conclusion that a big problem for Harriet is her helplessness. Considering all her nastiness, when push came to shove I expected her to act a lot more like a spitting cat than the lost soul she seemed to be. It made me think a lot more about how many of her problems stemmed from weakness. Not that any of that excuses the snark or the way she treats her friends, but it gave me something a bit different to sympathize with. I also sympathize with all those who say they think this sounds funny but not quite up their alley; I felt the same way for most of my read, and this wasn’t my fave NYRB ever, but it was a good change of pace for me, a good period piece, and also pretty fun. Those last chapters were much more uncomfortable for me, because it stopped being about how outrageous could she be. That final moment in particular revealed her character in a different light. I agree with you, though, that this probably wouldn’t be a book for everyone It’s not easy to like, but in small doses, I sometimes enjoy this kind of thing. Finally getting around to other peoples’ NYRB posts, Teresa, and you + Nicole have definitely convinced me to add After Claude to my list for the future. The “making him sound like an extremely rich, self-employed spy” line is hilarious! And this does sound eerily similar to Stephen Benatar’s Wish Her Safe at Home, except maybe Benatar’s protagonist is less nasty and more just deluded. That whole line is a scream, isn’t it? I do want to read Wish Her Safe at Home someday so I can make a comparison.